Ideal Tax Solution experts want taxpaying parents to know there are education credit and benefits to filing sooner versus waiting till the last minute. IRS Problems Aren't Fun But Our Experts Can Handle It. Ideal Tax Solution understands that parents pay a lot in education expenses for their children, but they may not be aware that there are a variety of education tax credits available to them or what type of tax help they can receive, especially now. Parents also may not be aware that there are clear benefits to filing their taxes sooner rather than later, says Beyon Tandy, CEO of Costa Mesa-based Ideal Tax Solution, LLC. Tandy goes on to say that parents who want to learn more about these education credits may visit http://www.irs.gov. There are specific criteria for these parents to meet, and the tax code can be confusing. There are forms to complete and filing dates to meet. Hiring an expert in tax matters is a wise choice. Offering tax help and providing taxpayers with solid solutions in all types of tax issues is why Ideal Tax Solution, LLC, was created. More information about claiming education tax credits may be found on http://www.irs.gov/uac/Newsroom/IRS-To-Accept-Returns-Claiming-Education-Credits-by-Mid-February. 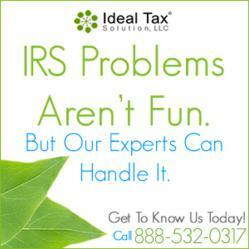 For more information about Ideal Tax Solution and its full range of services for U.S. taxpayers, visit http://www.IdealTaxSolution.com or call 888.393.5154. For good tax tips and information, find Ideal Tax Solution on Facebook and follow them on Twitter.